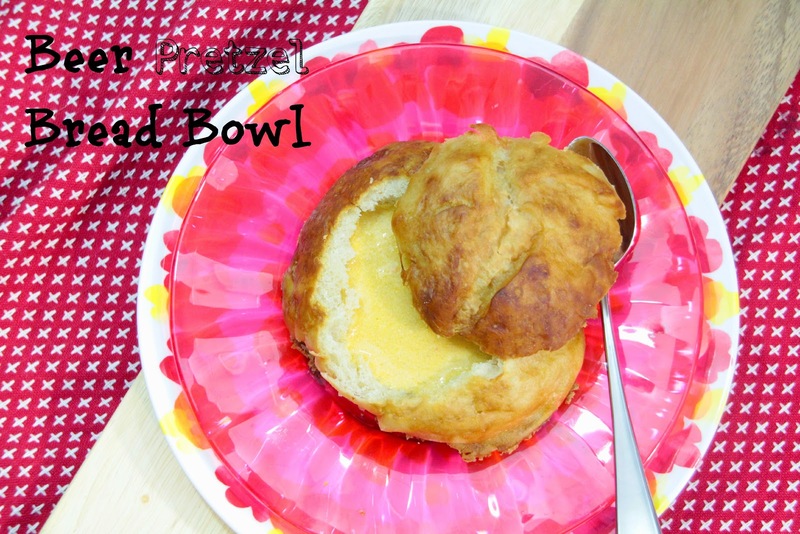 Though the recipe sounds a bit complicated, it really isn't - and you really want that extra step of boiling the pretzel bowls in the baking soda water in order to get the perfect pretzel texture. 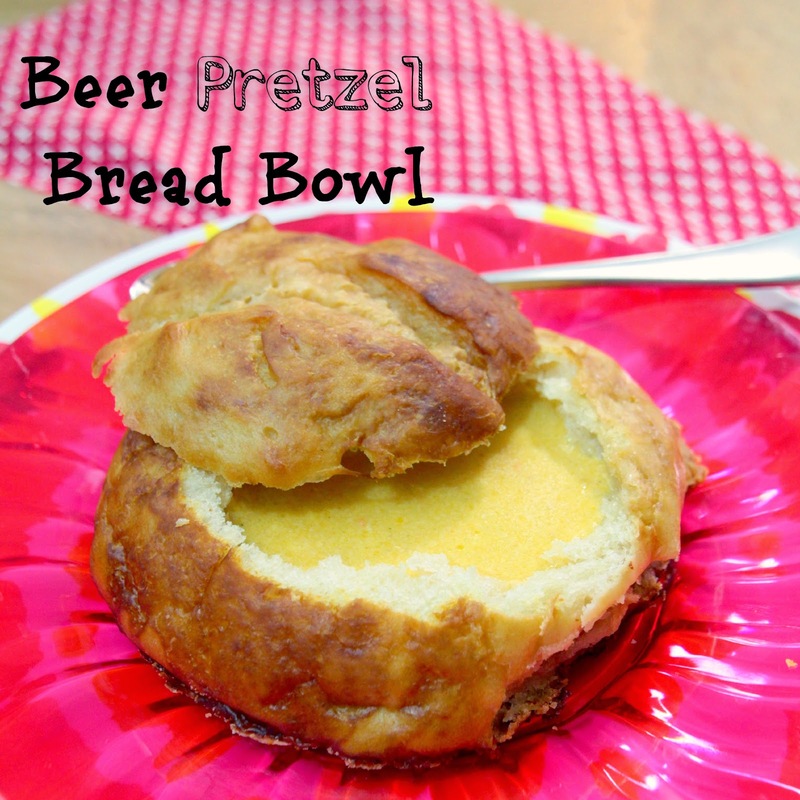 I loved the flavor of the beer in this pretzel bread. I used a beer from a local brewery - Mother Earth's Cali Creamin' Vanilla Cream Ale, which added the perfect amount of malty flavor and just a hint of vanilla. If you can get your hands on a bottle of this, you must try it. This may be my new favorite! 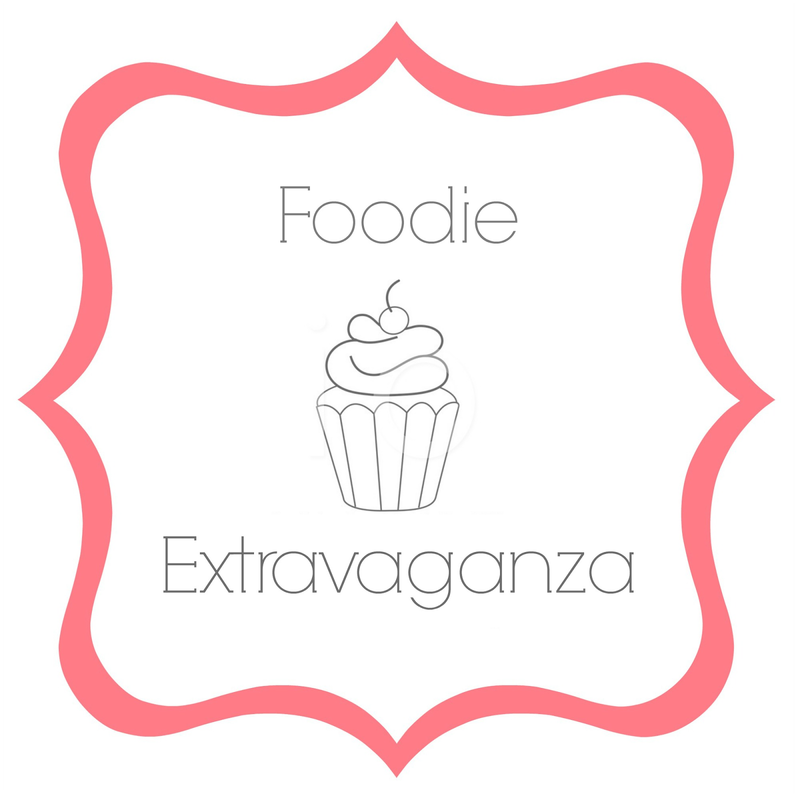 Before you check out my recipe, take a look at the other Foodie Extravaganza entries! In a large, non-reactive bowl, heat the beer in the microwave in 20 second increments until lukewarm, about 110 degrees. Add the yeast, stir, and let it activate, about 3 minutes. Next add the confectioners’ sugar and 4 tablespoons of the butter and stir to combine. Sift together the salt, bread flour, and all-purpose flour. Add to the yeast mixture and knead for about 8-10 minutes, using either the hook attachment of a stand mixer or your hands. Add the dough to a greased bowl and cover with plastic wrap and let it rise in a warm, moist environment until double in size, about 1 hour. After the dough has risen, divide it into 8 equal portions. (I like to make 8 small bowls, holding about 1/3 cup of soup - you can make 4 larger bowls if you like) Form into balls and place on a lightly floured surface. Cover balls with plastic wrap, allow to sit until doubled in size, about 20 mintes. Fill a large pot with water, making sure there is room for it bubble up without spilling over, but deep enough for the large dough balls. Bring water to a boil, add the baking soda. Cut an X into the top of each ball. Gently place one of the balls in the baking soda water and cook, turning once, for about 30 seconds. Remove from water and place on a baking sheet covered with a Silpat, or sprayed with cooking spray, cut side up. Repeat for all bread balls. Brush liberally with melted butter, sprinkle with salt. Bake at 375 for 25 minutes, or until a dark golden brown in color. 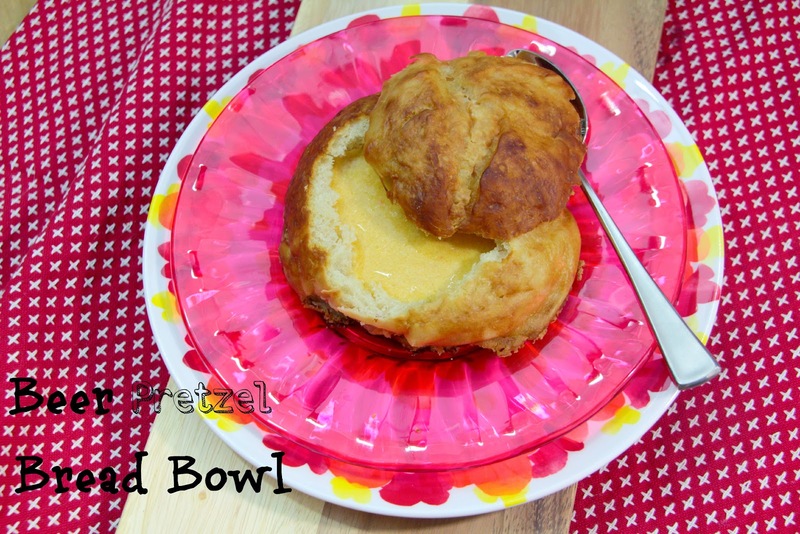 Well, the only thing that could make soup (which I love) any better is putting it in one of these pretzel bowls! I'm not seeing the recipe, though?? 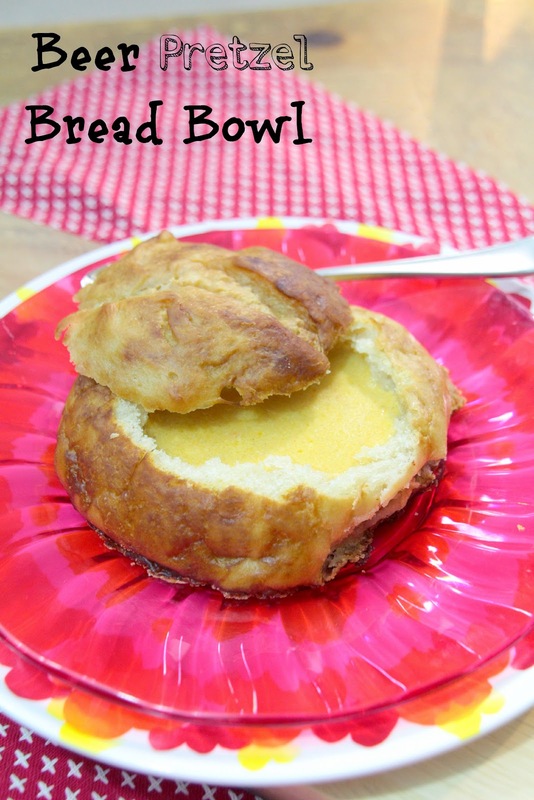 I am always looking for new bread bowl recipes.Never thought of trying pretzel dough. What a brilliant idea Susan!